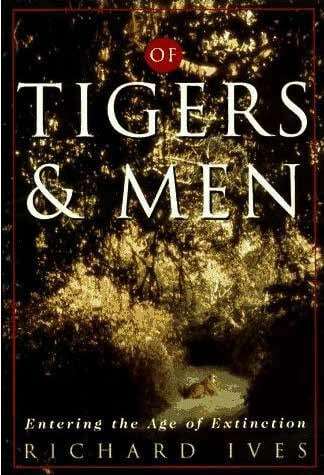 A book in five parts, Of Tigers & Men by Richard Ives, gathers momentum slowly. After reading two or three chapters, just before putting the book away feeling a little let-down, there is a surprise, a finale to all that seemingly unnecessary build-up, a gentle hint of reality, of the interaction between man and tiger, and his own journey as an author, a person, naturalist and tourist. Richard Ives dons all these hats in the book with ease and provides lucid descriptions from every angle. In the prologue, he introduces not just his subject and the striped star, but also an ‘informant’ who makes appearances in later chapters too. He writes Part One through the lens of a tourist, with vivid portrayals of the crowded dusty cities of India, conventional trips to national parks and thrilling tiger sightings. The author quickly moves away and delves into the story of meeting one of the famous ‘tiger men’, Billy Arjan Singh, at his farm in Uttar Pradesh. He draws out the unclear character of Billy as it evolves in his mind, over vague dinners and ominous trips to the jungle. Even as he slowly understands this person, he is told very matter-of-factly that there is no hope for the tigers. Shocked, he hopes still, and continues travelling. In the next part of the book, he meets his ‘informant’ again, who remains shadowy and veiled in his conversations with the author. There are chapters here that carry almost entire reprints from a manuscript that the ‘informant’ is working on at the time, clearly important to Ives, but quite a tangent from the rest of the book. And yet again, he is told the same insipid fact—there is no hope for tigers. Writing next from Indonesia, the book takes a turn to a philosophical journey of the self. Until now, Ives expressed terribly keen interest in meeting a tiger on foot, a rather “suicidal” notion as his friend wrote him in an anxious letter. But in Indonesia, he seems more worried about dying at sea, with chicken and other passengers on a crowded boat. Ives is lost in an increasingly bleak world, with rapidly vanishing tigers and a cynical co-passenger, a fellow naturalist, but an extremely foul-mouthed and bitter man. Ives recognises in this man an ideal example of one who truly believes that humans are not superior to all else in this world and also an example of how to continue living in bitter societies filled with “city-dwelling idiots”. All signs of hostility disappear when this man sees a new or rare bird and drowns blissfully in the beauty of nature. Ives continues his exploration, even as it enters the ‘Age of Extinction’. He ends Part Four with his dream finally coming true, seeing a tiger on foot, a magical experience that has him doubting its actuality. All these experiences seem to have left the author disturbed, sad and ‘wanting to be left alone’, almost like his crazy travel partner in Indonesia. By chapter 35, he is in Nepal and seems more unclear than before, lost and confused but still on his feet, shuffling nevertheless. The book is an odyssey, a voyage of man and tiger, of Richard Ives from being a tourist to feeling like an intruder. It builds intelligibly towards the end, giving meaning to the title. While the writing is clear and simple throughout, I couldn’t help but wonder if some entire chapters were even required; they seemed loose and without apparent purpose. But if one can look past this, it is great story-telling filled with vivid descriptions and occasional suspense, leaving you not with his view or opinion but leading you instead to your own.